Strathclyde Fire & Rescue are now offering FREE, yes FREE! 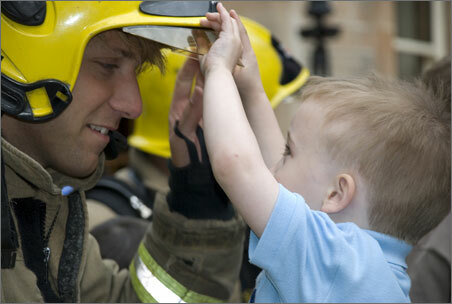 home fire safety visits to everyone in East Renfrewshire. Fire is a real risk to all of us in our homes, each year there are over 63,000 house fires in the UK, from that 14,000 people are injured and sadly 500 die. The truly sad fact is most could have been prevented. What are the common causes of fire in the home? Cooking, smoking materials, candles, any electrical items including the television, washing machine, tumble dryers, computers, hair tongs, mobile phone charger, overloaded multipoint plugs and extensions can all cause a fire. A recent survey found that 3 out of 4 Scots believe fire won't happen to them. What about you? Have you ever had a fire in your home? Has one of your neighbours? One of your family? But what are the chances of fire really happening to you? Did you know that in Scotland we're up to 2 or 3 times more likely to have a fire than in England or Wales? If a fire starts when you're sleeping you wont smell the smoke. You're up to 10 TIMES more likely to die in a fire if you don't have a working smoke alarm. We can fit one for you FREE. During the visit firefighters will check each room in your house with you, helping you to make sure your house is safe. They will talk to you about the dangers of fire in your home and how you can avoid a fire starting. They will also point, out and discuss with you, areas of risk that they find within your home. The average visit will last between 30 � 60 minutes. If you don't have a smoke alarm they will fit one free of charge for you there and then. Who will do the Home Fire Safety Visit? Firefighters from your local fire stations at Clarkston & Barrhead will visit your home at a prearranged time agreed with you. How do you arrange a Home Fire Safety Visit? Its simple just call your local community fire station at Clarkston or Barrhead on Clarkston: 0141 638 2222� Barrhead: 0141 881 2222 to arrange a visit. You can also free phone 0800-0731-999 or text "Check" to 61611on your mobile phone. If you leave a message for us we will call you back to arrange a time and date that suits you. Strathclyde Fire & Rescue will process the information you have given on this form for the purpose of administering our Home Fire Safety Visit Campaign. We will keep your details secure and will not disclose them to other organisations or third parties without your consent unless we are legally required to do so. Strathclyde Fire & Rescue Retired Employees Association is a recently established organisation which is open to all retired employees of Strathclyde Fire & Rescue, whether wholetime, retained, volunteer or support staff, as well as current employees with one year or less to serve before retirement. The original aim of the Retired Employees Association was to maintain contact with old friends & colleagues, to provide social, welfare, lifelong learning opportunities, drop-in centres. However listening to its members the Retired Employees Association has also added volunteer duties with Strathclyde Fire & Rescue. Recently Strathclyde Fire & Rescue and East Renfrewshire Council have established a pilot programme, based at Clarkston Community Fire Station, which will utilise retired personnel to undertake a wide range of community activities across East Renfrewshire.� One project will see retired staff assist East Renfrewshire Council with the existing home alert system and the provision of Home Fire Safety Visits.